Chopper is one of the worst choices as a stand alone, but he was at 10k power whereas my TIE pilot was barely 6k and I had no other choises. He worked good at picking off leftover skulls that moff or vader left behind. I do not recommend having chopper here as one of your ideals choices, but you work with what you have. I did it with HK lead b2 86 88 and rg. The biggest issue was phase 4, and I needed many attempts for some good RNG to get stuns from rg and ability block from hk and 88 on the elders. Key is to use aoe abilities to kill the skull bears, but timing them so that they are not on cooldown for phases 4 and 8. Another vote for troopers. Veers, Starck, snow, storm, magma works easily. You can sub Starck for anything else if you don't have him. I use Pal, Vader, Shore, Death, and tie pilot. They haven’t screwed me over. This event is the most **** I have seen yet. I have EP G10, Vader G10, RG G9, Moff G8, TFP G8, can't even beat the first tier, I gave up about 4 weeks ago too the last time this event ran. @jayjonbeach Try adding Snowtrooper, drop TFP. Load Snow with crit chance mods and use his AOE with extreme prejudice. Okay, unreal but I tried my droids, and auto'd thru T2, and most of T3 (beat it, went manual on final). color me impressed. My squad is far from ready, but hell I'll take the win. I just used my R2 team but their gear isn't great and no Zetas, but omegas on almost everything. Can't clear the bonus tier. Makes me want to upgrade Snowtrooper for the turn meter gains from the squishy Ewoks. I've cleared tier 1 and 2. Using the event special that heals is key. Ended up using it for TFP and Tarkin during both runs on tier 1 and 2. Omega'd TFP's AoE and made sure that he targeted the elder whenever he used it so that the elder was ability blocked. Try and save up Tarkins Ultimate Firepower for the stages with full health Ewoks, it'll kill all of them if you've left it a stage or two. Autobattled with ease Running HK, 88, bb, R2, K2. My K2 hits for 10k on basic 20k on special unbuffed, Double that when ID hits. I’ve been autoing it with droids. @Lilpup on the Mythic tier, troopers do not work. But if you lead with zVader and pop them all with DoTs right at the beginning of P8, they all slowly kill themselves with all of their many, many turns. Shoretrooper is excellent at absorbing all the damage. Use Thrawn to regen Shore's protection at every opportunity so Shore is all prepped for a severe beating in P8. Deathtrooper and Snow round out the squad. Thank you. I was trying to auto using that strategy earlier. Just manually went through and beat it...barely. I wold avoid the popcorn, it's high in carbs and kernels may crack teeth. Those may be old folk problems and not associated with yonguns trying to finish this event. doable with Veers, Storm, Death, Starck and Snow? Do not have Shore yet. need to be 7* ? What gear levels min? I have a solid Emp team , G12 Vader, Palp, Thrawn, Tarkin,Royal, most of mine are G10, but no zetas on these toons yet. I seem to recall this thing **** me off last time I tried it lol. Reading this thread makes me glad I have been working on Imp. Troopers lately as another team to add to the TBs/TWs. Just not sure how beefed up is good enough for this event. Love to get it to ezmode auto farm. Thank you. I was not able to do it with Troopers. I could get to the last stage easily, but with no fracture on paplo to take out Elder first I couldn't survive long enough. My troopers are g 11/12 too. 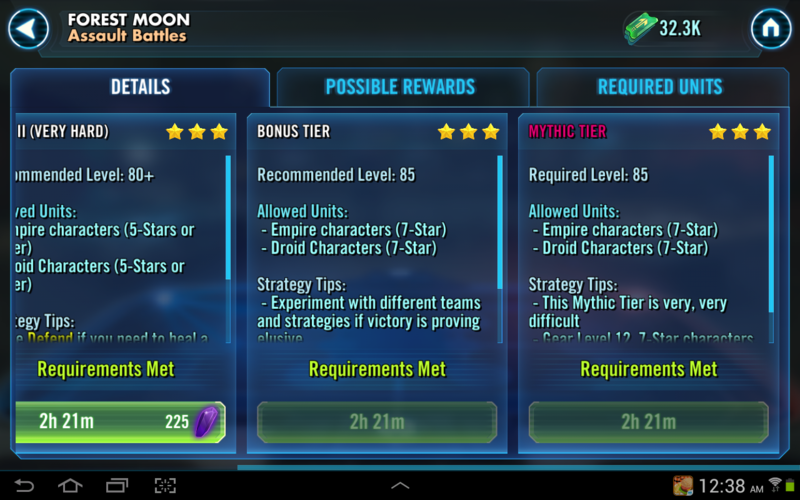 I use zEmperor, Vader, Thrawn, R2D2, BB8 for mythic tier. Save BB8 Illuminated for last phase. Fracture Paploo, Kill Elder, Kill DPS, Clean up rest. Have done it first try every time with this team, I just have to play it out which can take some time. For the non-mythic event I just auto troopers through all phases. My chiefwimateeka team got them easily as well. Yeah I got A zeta on k2 and he is wicket with T3's protection recovery. 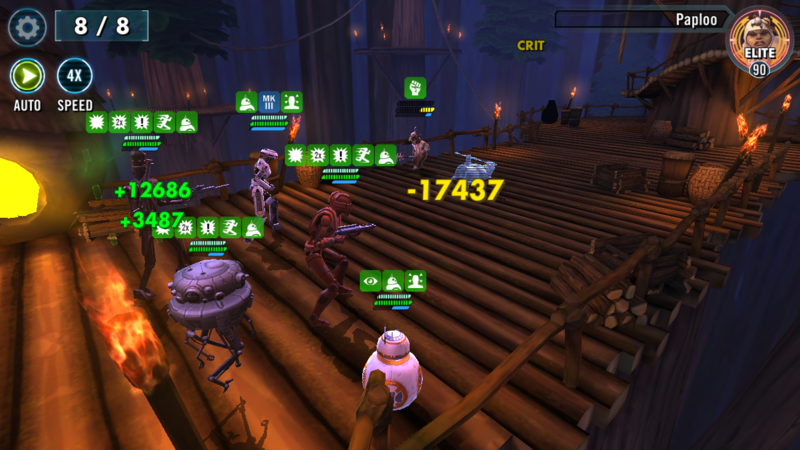 As well in A zeta rogue one team..
Only using bb8s massive skill to get an advantage at the two most difficult moment, those with the reviving deadly ewoks and the end game. Ability block from T3 is nice, such as palpi stun. Chopper is just chopper and k2 is tanking all the way. They even havent for best mods. 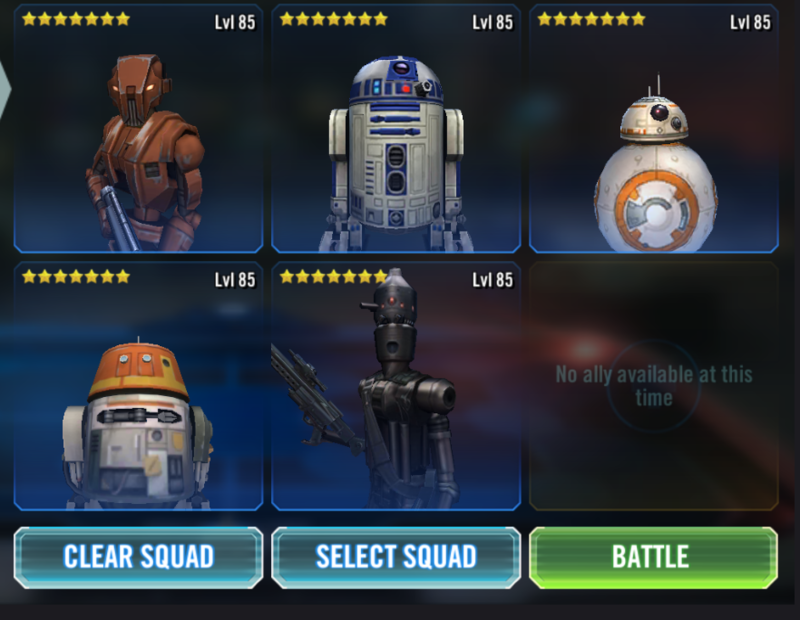 Droids on auto all 3 tiers. Didn't bother with T4, I already beat the mythic level a while back. @DuneSeaFarmer what was your Droid team, gear-wise? I threw BB8 on my usual Empire team and they destroyed the first 3.